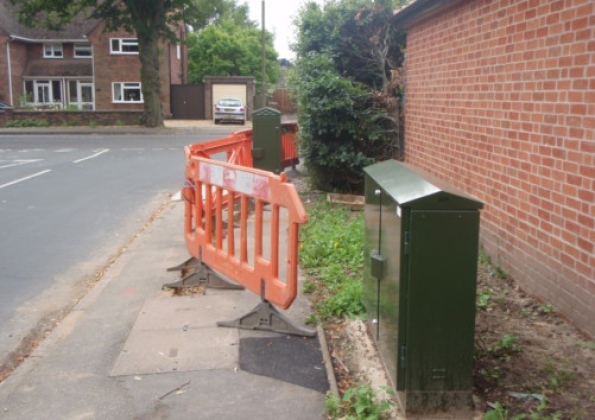 BT were in the news again this week after a resident complained that BT are putting public safety at risk after the installation of several superfast broadband boxes in Spalding. Rodney Marks said BT was lacking in “common sense” over the siting of its new Infinity boxes on pavements in Ladywood Road, Wygate Park and Broadway. A new BT Infinity box (left) installed on the pavement of Ladywood Road close to an old box and the junction with West Elloe Avenue. Mr Marks, of Ladywood Road, Spalding, has written to BT complaining that the boxes restrict the view of pedestrians, cyclists and wheelchair users, but also create a potential hazard for motorists. He said: “I noticed some workmen installing a BT box at the junction of Ladywood Road and West Elloe Avenue about five weeks ago and I was unhappy about it because they had to cone off the footpath in Ladywood Road to do the work. “Pedestrians had to walk in the road to get past the cones and anyone driving round the corner from West Elloe Avenue would have to break sharply for cars coming out of Ladywood Road. “BT has put the box slap bang in the middle of the footpath and two other boxes I’ve seen are within three metres of old BT boxes that are sited off the footpath. Mr Marks’ complaint has been taken up South Holland district councillor Gary Taylor who said: “I’ve written to the chief executive of BT to complain about this serious issue. Alan Spinks, Lincolnshire County Council principal highways officer, said he had received no “direct complaints” about the boxes but promised to look again at the positions in Wygate Park, Broadway and West Elloe Avenue. A BT spokeswoman said: “All the boxes put up in Spalding to supply fibre-based broadband to businesses and residents in the area have been installed in agreement with the planning and highways departments of Lincolnshire County Council.